Be sure to check back next week for a Tickety Bu Giveaway! Become a fan on our Facebook page to get the latest giveaway news and follow this blog, too!. a pair of 35" playsilks in the colorways* of your choice! (and share why, if you like!). by taking a stroll through our Etsy shop. The winner will be randomly drawn on Monday, November 15th at 10 PM est. and shipping is on us! 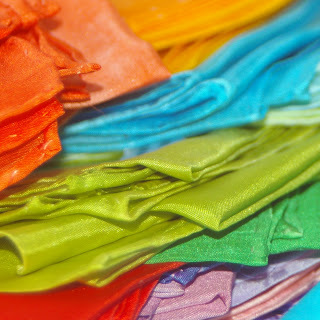 Playsilks are one of our favourite things~ all natural and durable, silk is a perfect tool for a a child's play. They are open-ended and child-lead, not to mention multi-age and beautiful toys. 100% silk, hand dyed with professional light and washfast dyes. 35" square, hand rolled hems. I love Punk Princess (because we have many silks, but none in that color combo) and Heart of the Fall Forest (would make a great backdrop for Donovan's dinosaurs!). waterlilies and good earth are the two that jump out at me straightaway. your work is just stunning, this would be amazing to win - especially right now, for our family. thank you for the chance! I would love Garden at Giverny & Regatta.. I love Monet & I love your playsilks, so those are my obvious choices! punkrockmom85@gmail.com is a way to get in contact with me. We love your beautiful work. All of it. I think my children would love Sweetheart and Midnight. SilverCherry and Heart of the Fire. Seriously, what great names! I own one of your silks and your nativety set and I and your work is amazing! Have a great holiday season. Oh, how fabulous! I think my daughter would love the Heart of the Fire and Heart of the Dawn colorways. She loves bright colors and reds and oranges. Hard to choose, but I think I'd want Regatta and Irises. Gorgeous. I love Regatta and Parliament. They really pop out at me :) We don't have any playsilks and I think my little boy would love them so much! They are all SO beautiful. Poppies and Heart of the Rainbow both blow me away. I suppose they are similar a bit, so I'd probably have to buy Fresh or Regatta, too. These are all so stunning. I love sunrise and sunshine. The warmth really appeals to me. This week is my birthday so it would be extra fun to win! I would love to have Good earth and starry night. Love your colorways! Have you ever thought of doing the 11x11 silks in the colorways too? I would love map of the world and hyacinth...because they are soooo pretty! Nice hues!! we already have ocean and fire and we love love love them! My daycare kiddos play with them every single day. We don't have any play silks yet, and would love to start exploring play with them. I looked at all the beautiful color's and was a little overwhelmed! :) I think I like ones that you could play was grass or water? I think I would just let you choose! Love Heart of morning mist and heart of sunrise. Beautiful. I love the playsilks because the possibilities are endless! Thanks for a great give away. Oooh! How to choose? Probably Heart of the Ocean and Heart of the Fire. My two year old and I could have hours of fun with these. And even better, she and her 13 year old brother could, too! If I was to win, I'd choose Heart of the Morning Mist and Rainbow Twister. Both are simply stunning! I would choose heart of the fire for my 3-year-old fire dragon, and fresh for my 8-year-old good-earth wizard. (Both boys.) Awesome givaway! Thanks! I'd pick Rainbow, because it would match my daughter's fairy garland crown from you, and Fire, because it matches my son's personality. ;) Thank you for this generous giveaway! I love the water lily and irises but it was really hard to pick just two! The art inspired colourways are gorgeous. I love Map of the world and starry night. I love all of your stuff. I love Sunrise because it really catches your eyes and it looks warm and refresh. It gives me the feeling of "another new day has come". The Heart of the Hyacinth and Sweetheart Playsilk colors caught my eye! So bold and beautiful. I would pick the heart of the berry patch and the summer berries colourways because we just can't resist berries in my house (and I love purple)! One of my faves is Iced Green Tea (I adore that colorway!) and second one is NEW Waterlily-- I fall in love!!! inspire me!! These are for dancing and twirling for sure!! Sunshine for my daughter who is sunshine in my life, and irises because I love the peace and tranquility of Van Gogh and the color combinations that echo his paintings of nature. Beautiful, thank you for the opportunity. I like parliament and heart of dawn. We'd also love anything that strikes you as being winter inspired as they would be our winter playsilks. Poppies and map of the world - but they're all beautiful. A happy challenge! They're all beautiful, b ut I think I'd go with Heart of the Morning and Starry Night. Thanks! Really any of your silks are gorgeous, but I tend to love the bright, bold combos the best as they just seem so happy. Wow, I don't think its possible to pick just one...or even two favorites. I love the vibrant colors you use. If I have to pick I would say the Regatta is my fav. And I love the Fairy Land hand painted silkscape...gorgeous! Heart of the fire and Map of the earth are my two favourites! You have beautiful silks. I've always wanted to try these with my children to see how their imaginations would take over...maybe now is my chance? Heart of Hyacinth b/c those are the first beautiful flowers of spring around here. The first color after all the brown and gray. Also, map of the world green. The color is the ocean, swirling. My girls would love love these on Christmas morning. Your shop has so many beautiful creations. Thanks for the chance to win. I love all the colorways and would love to win. If I win, surprise me! I would go with Heart of the Morning Mist and Heart of the Dawn. They are so gorgeous, and perfect for my sweet little girl! It would be AMAZING to win them! I love Map of the World and heart of the fire. These are gorgeous! Contact info on my blog, thanks! I would choose Good Earth and Fire. I love the elemental feel of these colorways and the symbolism they invoke! They are truly inspiring! I'd go with Icecap and Garden at Giverny. The first is sharp and clear and the second is sort of fuzzy - each has its place for sure! Heart of the Sunrise and Heart of the Dawn would be my choices if I was so lucky as to win this, my daughter is very drawn to pinks and warm colours right now. She loves playsilks and would treasure this so much! What a great Solstice gift this would make!!! I will love the pink and purple silk!! Thank you for the giveaway. I am your big time follower! I'd choose map of the world and twirligig daisy. I am most drawn to the NEW Map of the World (35 inch Playsilk) & the Heart of the Morning Mist (35 inch Hand Dyed Playsilk). I envision my little one pretending she's swimming by spreading out the Map of the World playsilk. Or looking at the sunlight coming through the Heart of the Morning Mist silk. Gorgeous! I really like Irises for my daughter and Good Earth for my son! I love the open ended play that play silks provide. I love Map Of The World and Heart of the Hyacinth, They are both amazing colors and I just love them! Punk Princess, for my 19month old daughter to use. We don't have any playsilks but I love Heart of the Rainbow and Garden at Giverny. They are just beautiful and I know my girls would love them. Thanks so much for the giveaway! We love our playsilks...such wonderful open-ended play comes from them. We love Heart of the Dawn and Heart of the Fire. loving all the colors in the playsilk rainbow palette. Especially the blue and yellow... so beautiful! It's so hard to choose! I love the Water Lilies colourway, and maybe I would choose the Rainbow Twister for my nephew. Definitly Starry Night and Heart of the Fall Forest! All of them are beautiful though! They have the colors I like most. Love all your gorgeous work! we love the 2 playsilks we have ordered from you and the wearable wonder dress up skirt and head garland are beautiful as well that I purchased for my daughter for her bday. I love something specific about all your colourways but if i were to choose 2 it would be Good Earth and Ice Cap. Good Earth because well I love anything Earthy and think it would be beautiful for a playscape and Ice Cap because would love to create a water/river playscape for my daughter. I would love the Map of the World and The Heart of Fire. I think both would be great backgrounds for my daughter's Groovy Girls. What a great giveaway! I'd love turquoise blue (mix or/and solid)! Wonderful giveaway - we got our first bunch of silks from you for our daughter's 2nd birthday last month and she loves, loves, loves them. With Christmas coming I'm tempted to introduce some of her cousins to the joys of playsilks -I think Sweetheart and Heart of the Hyacinth would suit her cousin nicely. I would love to enter this giveaway, and the color way of my choice would be two earthen tones, I like your brown and golden looking shade, I would choose those colors because they are of the only shades that I do not have already.. I really am drawn to the Good Earth and Heart of the Ocean play silks. These would be overtaken with little wooden animals and scenes in no time, I am sure. I love http://www.etsy.com/listing/42656897/sunflowers-art-inspired-playsilk-35-inch and http://www.etsy.com/listing/61266145/heart-of-the-dawn-35-inch-hand-dyed. I also love their names!! I also need to do some Christmas shopping! Lori, your silks and toys are so loved here!!! I would love a mixed green and an ice cap playsilk for my niece. I like the Hearts of Fire one! I like them mostly because of the gorgeous color (my favorite colors are purple) and the second one reminds me of a beautiful sunset. I'd like Heart of the Barry and Heart of the Rose. I like Heart of the Dawn and Sunshine, beautiful colors. lovely colors. thanks for this giveaway. i like heart of the hyacinth, heart of the dawn, sunshine, and heart of the fire. whew, that's a lot! I like Heart of Sunrise and Heart of Ocean because those have my daughter's favorite colors. I love the Twriliwig Rose and http://www.etsy.com/listing/59071619/upcycled-multi-strand-rosette-necklace! "Fresh" and "Poppies" are my favs, I adore jeweltones and those are the perfect tones to play superhero! Punk Princess... bc purple is my sons fav color right now!! And, Regatta... bc it's just so pretty!! These are spectacular - thanks for holding the draw! I love the Heart of the Rainbow colourway for the kid I had in mind... but I would wear the Heart of the Rose silk myself. They're all beautiful! I would choose Heart of the Ocean and Heart of the Spring. My almost 3 year old loves to play with his toy farm and these would be perfect for ponds and fields! i think the spring green and yellow combination is so refreshing and happy. That's my favorite. OMG!!! What a neat site! And I love the playsilks. What a cool thing for kids. Just looking at the colors made me feel like a kid so I want them for myself. I love the feel of silk, I think it makes you feel so special. I love the Heart of the Morning Mist, so light and soft looking. And the Garden of Giverny...beautiful! Your website is wonderful. I have 2 granddaughters and they both love to craft so we have special times when we get together and make things. I will be using your website and Christmas is coming too. You can catch me at omiewilliams@gmail.com and omzblog.blogspot.com. Thank you for sharing. What a wonderful giveaway! I would love to win Good Earth and Starry Night. This would make my daughter's collection complete! I adore your playsilks! They are the best around both in design and quality. They are my daughter's favorite toys as well. Thanks for all your beautiful work! I love these playsilks! My favorite colors are Good Earth and Heart of the Fall Forest! 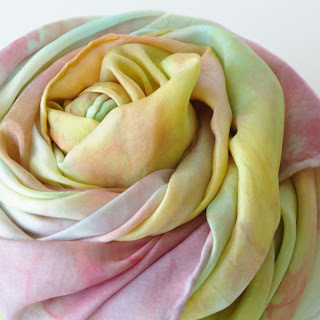 Your silks are so beautiful and i love how the colors so rich and well paired with one another! The colors are so vivid! Heart of the Rose has beautiful colors and I like Garden at Giverny - purple and green are my favorite colors. Gorgeous colours! I would choose punk princess for my daughter and sweetheart for my son. I love punk princess because my princess has recently changed her fav color to purple and Starry night because the boys love blues. I am so excited to have found your etsy shop (and from there your blog) tonight. I have been playing with felt all week (making a horn of plenty and harvest vegetable set for my kids) & am also working towards my daughter's fairy birthday party and Christmas. I can only imagine the level of play & enjoyment they would have with the map of hte world & heart of the hyacinth playsilks with the brand new-to-us treehouse that santa will be bringing for my son. I was looking for playsilks for her party & came across your work - absolutely fabulous. I'll be adding the fairyland hand painted silk to our wishlist for Christmas - what an amazing dreamland!! I love rainbow twister and heart of the rose! My daughter loves your silks so much!!!! I would choose Summer Berries, because it's all her favorite colors, and then... Fresh. Or Map of the World. Or Fresh. So hard to choose!! I'd choose heart of the fire and heart of the forest. So gorgeous. It's a very hard choice. i *think* i would choose heart of the fall because we are lacking in autumnal colored silks and heart of the ocean because my daughter is obsessed with all shades of blue. thanks for the opportunity! Great giveaway! My son loves playsilks-he dresses up in them, he wraps them up and rolls like a burrito on the ground! LOL and he loves to just snuggle in them. Garden at Giverny and Heart of the Sunrise. Heart of the Sunrise would be what we'd love. I just realized that I left my comment on the wrong section. LOL Guess I WAS too excited. :-) Definitely love "Heart of Fire" and "Garden of Giverny". Also, posted to my FB page. I would choose Heart of the Rainbow and Good Earth colorways. My 3 year old would love playing with these. 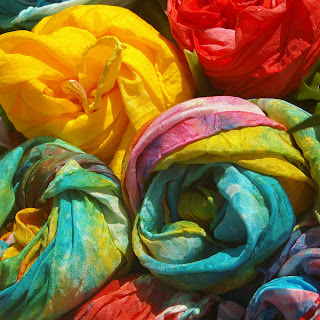 I love the fresh dyed scarves and the rainbow as well. Oh, we can never have too many playsilks! I dyed a few small playsilks with my son and they are among his favorite toys. I'm thinking about dying some for the little ones in our extended family for gifts this Christmas. heart of the fall and fresh! they immediately appealed to me but i also had to stop looking or i would want them all! :) this would be the start of our silks collection.